These vipers are characterised by the presence of a pit between the eye and nostril on each side. · Common Green Pit Viper (Fig 12.12): It is also referred to as the bamboo viper, and its scientific name is Lachesis gramineus. It is the commonest of the pit vipers, and is found in most of the hilly regions of India. · It is vivid green or yellow in colour with a whitish or yellowish line on each flank. The head is flat, broad, and triangular. Pupils are vertically elliptical. Belly may be mottled. Length varies from 2 to 3 feet or more. As the name suggests, it prefers to reside among bamboo trees, though it is also commonly encountered on other trees. · Large Spotted Viper: The scientific name of this snake is Lachesis monticola. It is confined to the Himalayan region, and is brownish in colour, growing up to 3 feet in length. The head may have a V mark, because of which it is sometimes mistaken for Russell’s viper. o The horse-shoe viper (Trimeresurus strigatus) and Anamalai viper (Trimeresurus anamallensis) are commonly encountered in the Western Ghats and the Nilgiris. 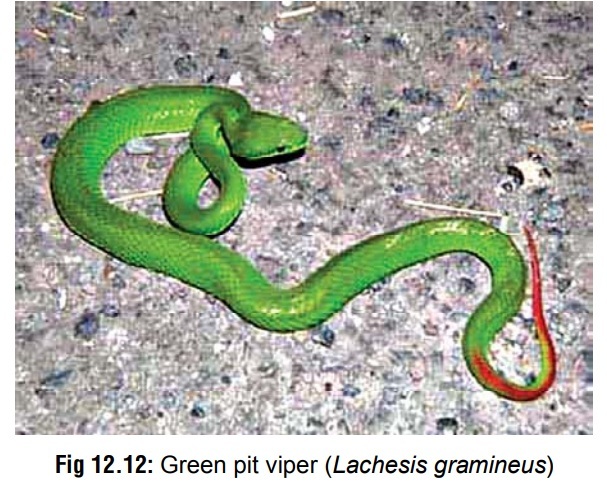 o Other vipers encountered in this region include the large-scaled pit viper (Trimeresurus macrolepis), the Malabar pit viper (T. malabaricus) (Fig12.13), and the horseshoe pit viper (T. strigatus).Envenomation with most of these snakes results in localised pain, swelling, and bleeding. No fatalities have been reported. o T. gramineus (Indian green tree viper) is said to be acommon source of bites in Peninsular India, primarily hilly country with dense undergrowth, especially among farmers, and those picking tea. Fatalities have been reported in children with this snake. o Envenomation with T. purpureomaculatus (Mangrove pit viper) causes local pain, swelling (which may extend to the entire limb), local necrosis, and enlarged lymph nodes. Coagulopathies are possible. Fatalities have been reported. · Pit Vipers of the North-East: mountain pit viper (Ovophis monticola), Jerdon’s pit viper (Protobothropsjerdonii), Medo’s pit viper (T. medoensis), Pope’s pitviper (T. popeiorum) which is generally found in hilly regions up to 3,000 to 5,000 feet, and is common on tea plantations, spot-tailed pit viper (T. erythurus), and white-lipped pit viper (T. albolabris). Envenomation results in local pain, bruising, and swelling with exten-sion beyond the bite area. Local blisters and necrosis are less likely to occur. Coagulopathies may occur; fatal intracranial bleeding has been reported in some cases. i. This is the commonest pit viper in the Himalayan region and Kashmir. ii. It grows up to 2 feet or more in length, is brownish in colour, and usually has mottled “carpet” patterns (dark longitudinal lines that are interrupted by paler cross bands) on the back. The belly may have red spots. iii. When agitated, it coils itself tightly, and vibrates the tail vigorously (like a rattle snake). · Envenomation results in immediate local pain, blistering, and swelling of the limb, which can be extensive and may last for several days. No systemic bleeding has been reported; patients usually recover with no apparent permanent disability. o The hump-nosed pit viper (Merrem’s hump-nosed viper) is one of India’s tiniest venomous snakes, its total length ranging from 28.5–55.0cm. symmetrical plate scales (supraoculars, frontal and parietals) on the top of the head in addition to the smaller scales typical of all vipers. There are heat sensitive pits between the nostril and the eye. o Colouration is very variable and includes grey, cream or brown on the dorsal surface, which is heavily marked with dark brown or black chevrons whose apices touch the mid-line, or with brown and/or black blotches. The ventral surface is grey, yellow or brownish, sometimes with brown or black spots. o It is mainly nocturnal and both arboreal and terres-trial. It can be found in both wet and dry deciduous and secondary forest areas and plantations. It is a frequent cause of bites to rubber plantation workers who harvest latex before dawn. It often rests during the day in leaf litter beneath trees and bushes when it is most frequently encountered. Its habit of resting on bushes brings it into contact with plantation workers or agricultural workers who tend bushes. o Its geographical range is believed to be the Western Ghats as far north as Goa but may well be more extensive. It is also found throughout Sri Lanka. o The hump -nosed pit viper’s venom is anti-haemo-static and causes both coagulation abnormalities and acute renal failure. A common feature of Hypnale envenomation is the late onset of systemicsymptoms. Disturbances in coagulation often do not appear for 12 hours and therefore it is vital that patients are monitored for 24 hours. The species can also cause severe local swelling although the only objective measure suggests not to a sufficient extent to require surgical intervention.